Thank you all for the much needed week off. It's been a bit of a go 'round here. Artoo did end up getting sick, and we ended up going to the Emergency for a bit on Tuesday - luckily the doctors told us that we did everything right and got ahead of it enough that he recovered quickly. Artoo wanted to wear his Beads of Courage to the ER because he really didn't want to go - but he said his beads would make him brave. And he did really great. 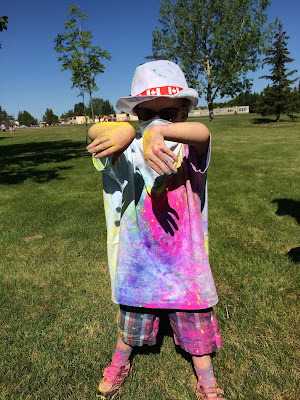 He held on tight to his beads while they took his Blood Pressure (one of his least favourite things) and afterwards he said: "Mom, i was really brave, wasn't I?" So brave. To celebrate them sending us home with meds (instead of staying) we went to have a celebratory Sundae. The rest of the week was taking care that his Respiratory Rate stayed where it should, and cuddling and watching lots and lots of Sponge Bob. Meanwhile, Chewie had his year end dance recital for his Hip Hop class this weekend. I took him for his dress rehearsal, and on the way home he asked if he could show me a cool thing he saw with his grandpa - his driving diretions were: "It's by the sushi place before we go to our house"
With not much to go on, we actually managed to find it! And while his dance recital came at the tail end of a very long and exhausting week - i was super proud of him, and loved every second watching him on that stage. He was so excited and pumped to dance for an audience. 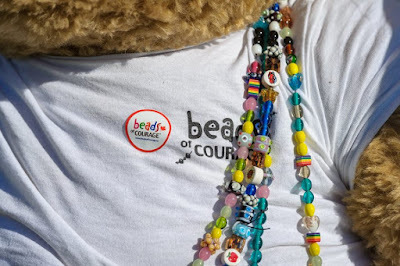 Weekly Challenge #271: "Beads of Courage"
Beads of Courage is an arts in medicine program that helps kids with chronic or life threatening illness tell the story of their medical journey. Each bead represents something different. A different procedure or appointment, or special circumstance. For example, when seeing a doctor or getting a poke instead of getting a sticker when they leave, they are given a glass bead for each thing. (blue for doctor, black for poke... some other beads are yellow=night in the hospital, pink=respiratory support, magenta=trip to emergent care, teal=tube insertion or removal, rainbow=therapy; physical, speech, occupational, respiratory) and every child's string is different and unique to their story. I got involved with Beads of Courage 4 years ago when my friend Tara and I decided to organize a 5K Colour Fun Run to raise money for the Beads of Courage programming in Saskatchewan. Runners start out in white - then they run through 5 colour stations where volunteers throw colour at them to symbolize the beautiful coloured beads that kids on this program accumulate through their medical journey. Artoo's favourite colour - GREEN! Artoo really loved running this year! Here is is running with B-rad and Grandpa! One of my favourite moments this year was cheering Artoo across the finish line! It was a really amazing day, it truly was! So!! This week's challenge is to BEad INSPIRED by Beads of Courage! 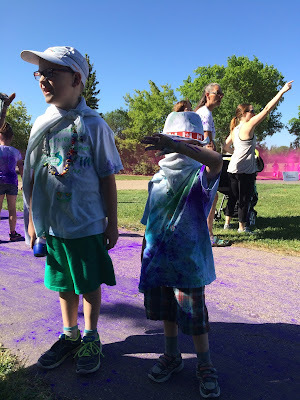 By our Colour Run, or by whatever gives you Courage. For my tile, i used a technique called the Hefty Hack (you can google it, it's super easy and super addicting!! there's lots of YouTube tutorials) to make a colour splotch on my tile, then tangled a string of beads - inspired by Artoo's string in the photo above. And if you're on the Zentangle Mosaic App, - i'm @iamthediva - come on by and follow me, and i'm going to be using hashtags on the app for each of my weekly challenges. So if you're game use the hashtag #DC271 (Diva Challenge #271) for your tile this week! Laura, there are no tutorials in You Tube and only some Hefty Hack while googling in Instagram, but no one telling how tomdo it. Can you give us a link???? Yes, it's clear now. Thank you!!!!! I'm happy that Artoo was able to go home. Nice to spend some time with your boys one on one. I have four and I still crave some time alone with my all too grown up boys. So, enjoy it while you can. I love your colorful tile and your beads are lovely! I'm glad Artoo is on the mend again. 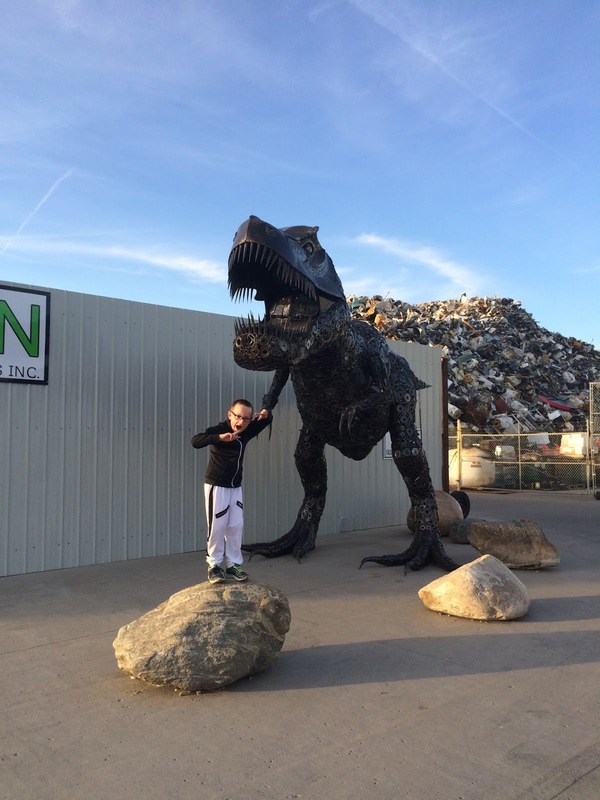 When you have more than one child, there are always times when you feel you aren't able to give time to one when he/she needs it, so those moments like you had with the dinosaur are very precious. I admire both your boys, for different reasons because they are different but you have every right to be proud of them both. Estupendo blog. Estoy ahora aprendiendo Zentangle. ¡Gracias! Yes Karen! 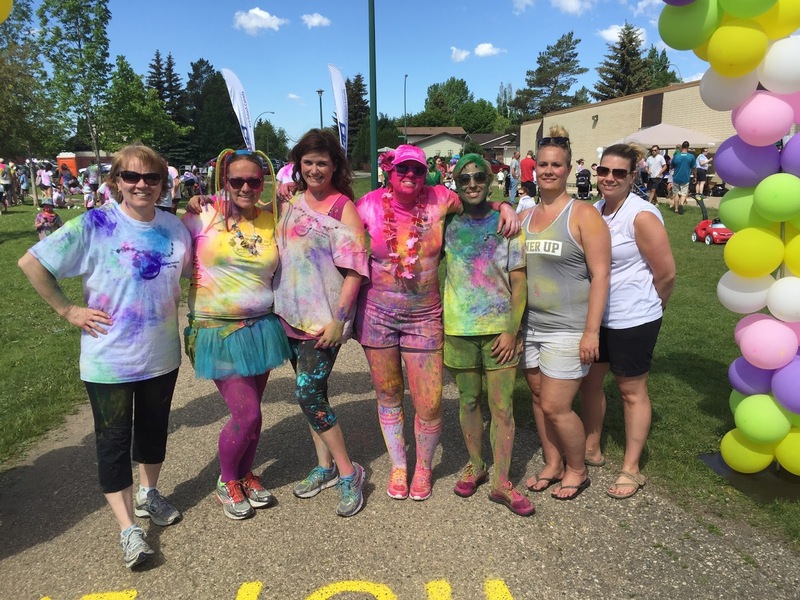 Our run was inspired by the Holi Festival in India! I love the whole beads of courage idea and thank you for this lovely challenge. Your boys sound wonderful. I've just learned how to do zen gems this week, so have included one in my beads. My beads are for my mum, who has battled lymphoma twice and has chronic physical problems as the result of the treatment. So proud of her, she's just started hydrotherapy at the age of 70 to try and keep herself going despite a lifetime of not liking water. Thank´s for sharing the story of the beads. It really is a fantastic project! You are always such an inspiration. Thank you. Not sure if I did correctly but had fun doing it.What a beautiful cause!!! Thank you! Pat yourself on the back! It's hard enough to give equal attention when everyone is healthy. I'm glad you followed your intuition and found the really cool thing that Chewie wanted to share with you. Thank you for the inspiration! This is my first diva challenge. It was fun and I learned a new technique using color. I love the bead idea too. I look forward to more challenges. first time to join the challenge! !i love the new techique!! Beads of courage is a wonderful project and that is the challenge for this week too. Thank you also for sharing a new technique. Your tile is beautiful!!! Thank you for the great challenge this week and for telling the Beads of Courage story and their meaning. Artoo deserves a medal as well! I'm happy you had a well-deserved break - we all need to give ourselves a chance to rest! Thanks for the fun challenge and for sharing that Hefty Hack technique - so much fun! My first time to use colour on a Zentangle tile - thanks for the push. I feel like mine was too similar to yours, usually I try to come up with something original. But I enjoyed doing it. :) Hope Artoo is feeling so, so much better.